Maybe this is a bit too much information, but in this hot weather I just don't dig wrapping myself in a big fluffy terry robe after the shower. And on the hottest days, I even find terry towels just too heavy and warm to use. (Casa Austin is A/C-free.) 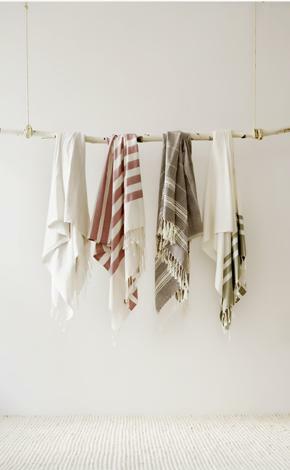 So here's what I'm craving: Turkish hammam towels, also called peştemals. I first saw the giant stripey flat-weave beauties at the Conran Shop in London a few years ago and really loved. But they were a touch pricey and there are so many more exciting ways to part with cash on a London vacay, so I gave them the pass. Last year the good people at West Elm had lovely small hand towel versions and I snapped them up. But the full size, wrap-right-around-your-body size are still a little scarce on the Canadian retail scene. A quick Google search unearthed the most gorgeous collection of them at L'Aviva Home. What a great site -- how come I've just discovered it?? 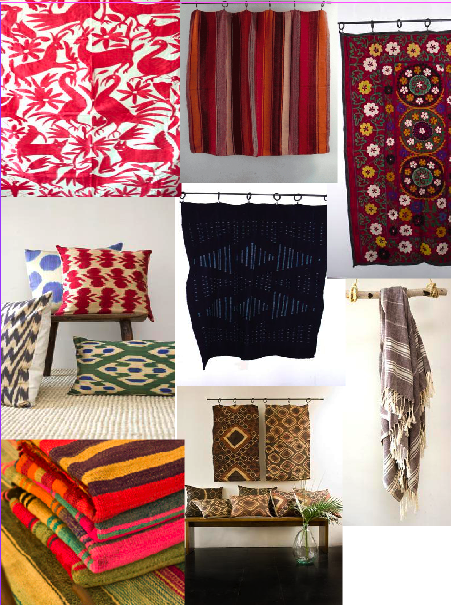 If you are a textile nut at all, you really should click over to L'Aviva Home -- and get your credit card ready. There's no chance you'll be able to resist the lovely things.